BAHRAIN champions Manama suffered a disheartening 95-105 loss to Sharjah of the UAE yesterday in their opening Group 'A' game of the 38th Gulf Clubs Basketball Championship, being played in Muscat. The tournament also acts as the FIBA Asia Champions Cup GBA Qualifiers. 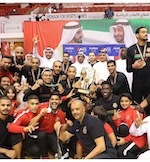 A collapse in the fourth and final quarter, when Manama scored just 11 points while giving up 32, led to the defeat after the Bahrainis were in control for most of the contest. They even enjoyed leads of up to 14 points in the second half before giving it away midway through the final canto. Manama's six-foot, one-inch American guard Terrell Stoglin (185-G-91, college: Maryland, agency: Octagon Europe) waxed red hot in the third period, during which he scored 17 points, to help turn a close game wide open. They headed into the final 10 minutes of the contest with a comfortable 84-73 advantage, but that would quickly be erased by Sharjah who were spearheaded by their own high-scoring US import, James Justice (178-PG-89, college: Martin Methodist) Jr. Justice Jr. sparked a 17-4 Sharjah run to begin the fourth. He scored 13 unanswered points during that span, including the go-ahead basket that gave Sharjah the lead at 90-88 with just over five minutes remaining. Nothing was clicking for Manama at this point while Sharjah were making basket after basket. Emirati forward Jassim Abdulla buried a three-pointer to make it 93-88, and several possessions later, back-to-back triples by Omer Alameri and Abdulla stretched their lead to 100-89 with just two minutes 56 seconds remaining. Manama tried valiantly to make one last push to get back into the game, but they came no closer than six points the rest of the way. Justice Jr. finished the contest with 42 points. His team-high output included four three-pointers, seven rebounds and four steals as he was an efficient 16-of-23 from the field in the game. Countryman and fellow-professional Tyler Wilkerson (203-F-88, college: Marshall) added 31 points, 15 rebounds and five assists, while Sharjah captain Jassim Mohammad Abdaalj added 13 markers and Alameri chipped in with 11. Stoglin matched Justice Jr. on the scoresheet by scoring 42 of his own for Manama, including six three-pointers. He shot 15-of-28 from the floor, dished out six assists but also committed a costly eight turnovers. 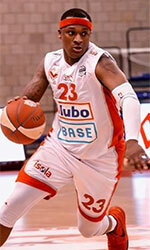 Seven-foot, two-inch NBA veteran Loren Woods (218-C-78, college: Arizona) added 19 points and 14 rebounds in the loss. Bahraini guard Hassan Nowrooz also finished with 19 points in the game as the only other player in double-figures. The loss for Manama meant that they will need to win their final two group games to have any chance of advancing to the next round. They will be hoping to bounce back the next time they return to the hardwood at Sultan Qaboos Sports Complex tomorrow to take on Nizwa of Oman. Today is a rest day. This tournament involves seven teams from across the Gulf, with the champions claiming the lone slot available for this September's Champions Cup.